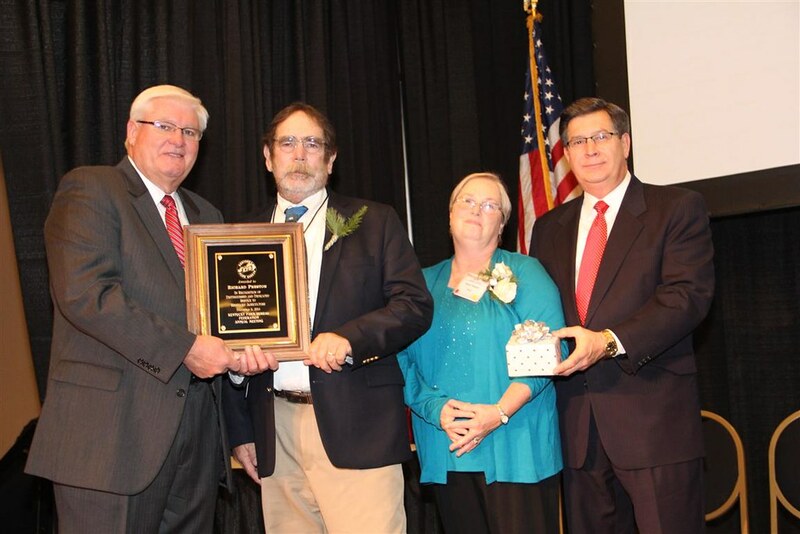 Louisville, KY (December 5, 2014) – Hardin County farmer Richard Preston has been named winner of Kentucky Farm Bureau’s annual award for Distinguished Service to Agriculture. He was honored at the organization’s 95th annual meeting at the Galt House Hotel, receiving an engraved watch and a plaque. Richard Preston (center left) received the 2014 Distinguished Service to Agriculture award with his wife, Alana (center right), at the organization’s annual meeting, held in Louisville. The award was presented by Mark Haney, KFB President (left), and David S. Beck, KFB Executive Vice President (right). Beyond his many achievements in farming and in service to the agriculture industry, the 67-year-old Preston has one of the most unique stories of any farmer. He was raised on a small hobby farm near Glendale with aspirations of being a farmer. But his exemplary academic standing led to a scholarship at the University of Kentucky, where he earned a degree in Chemistry. He then landed at Yale University on a graduate fellowship, earning a Doctorate in Physical Chemistry. In 1977, Preston was working as a research physicist at the University of California when he decided to come back to Hardin County and start a farming operation. He purchased 40 acres of cropland and some used equipment. He started out raising corn and hogs. Today, he and his wife, Alana, farm over 2,000 acres of row crops and have four employees. Along the way Preston has made a mark in many circles with farm organizations and youth groups like 4-H and FFA. He’s been widely recognized for his innovative production practices and as an advocate for using sound science on the farm. Preston has served on KCGA’s board for 11 years and also has long been active with Hardin County Farm Bureau. He has spent much of his adult life teaching and coaching youth and young farmers. He taught the first computer programming class in Hardin County schools, as well as physics at Elizabethtown Community College. He’s been a strong FFA and 4-H supporter plus has been a PTA Chapter President and a youth baseball and basketball coach. His daughter, Leslie Meredith, a teacher at West Hardin Middle School, was the 2013 recipient of KFB’s “Excellence in Ag Literacy” award.